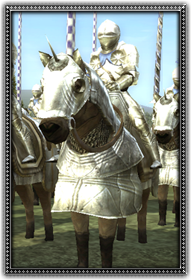 These elite warriors are arguably the ultimate evolution of the medieval knight. Their armour has been perfected by decades of experience, and whilst heavy, the weight is well distributed giving them ample flexibility. Combined with the knightly spirit of old, the only thing they need fear is a well aimed musket bullet.